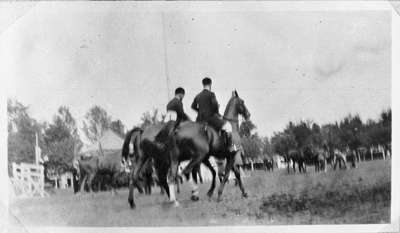 Black and white negative of a photograph of two horses and riders at the Whitby Horse Show in either 1913 or 1914. The horses are dressed up as hunters. There are other horses in the background. The first Whitby Horse Show was held in the Town Park on 15-16 July 1913. The president was Fred Hatch, the vice president was Thomas Cussion, and the secretary was Albert W. Jackson. One other horse show was held in Whitby in 1914 but after that the events were discontinued because of the First World War. Horses and Riders at Whitby Horse Show, c.1913-1914, Photographer Unknown. Whitby Archives 30_004_004.